Let me preface this by saying I never win anything, ever. So it was pretty amazing that in the past few months I won two giveaways! This photo is everything I won in both giveaways. The first prize I won was from Karen over at Unpack the Box. She subscribes to tons of subscription boxes ranging from beauty to lifestyle and even pregnancy boxes. She gives thorough reviews of all the boxes and she also does beauty reviews, please go take a look at her blog. She also has amazing giveaway, obviously! The prize was the Julep Naughty and Nice Mystery Box. In addition to the items in the photo there were also small packets of skin serum, hand cream, and some green tea blotting papers. I received 6 full size Julep polishes including (pictured from left to right) Alaina, Nellie, Brenda, Aviva, Joanna, and America. I also received a face primer, a double ended eye pencil, a lipgloss in Timeless, and Rock Star hand cream which smells so pretty! I love everything that I got in this giveaway, thanks Karen! I can't wait to use these polishes, all the colors are gorgeous! The next giveaway I won was actually through Instagram. Kelsey has an amazing account with gorgeous makeup and and face of the day photos, you go check her out on her Instagram and Twitter. She's running another giveaway soon! 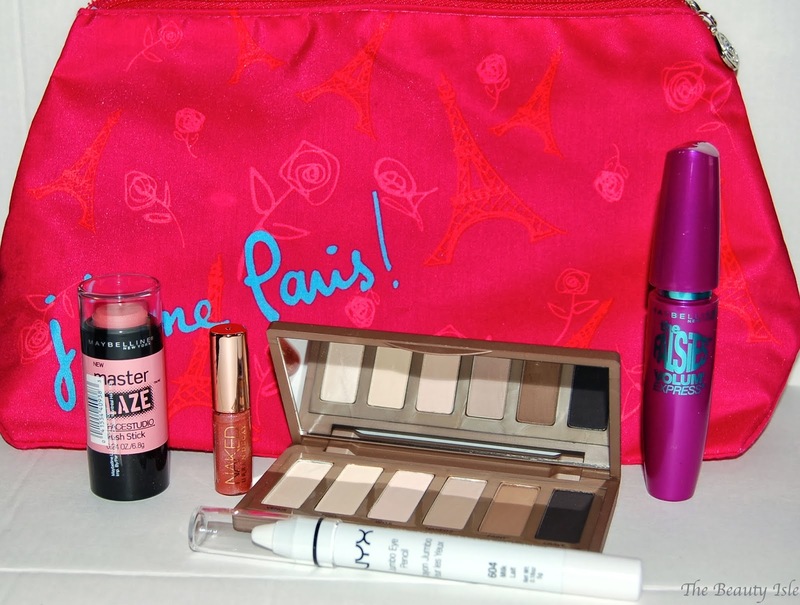 In this giveaway I received a pretty makeup bag, a tube of Maybelline Falsies, one of the new Maybelline cream blushes, a sample of the new Urban Decay Naked glosses, a NYX jumbo eye pencil crayon in Milk, and the Urban Decay Naked Basics Palette. Another amazing prize! I've been wanting the NYX crayon in Milk for a while now, from reviews it seems like it really makes shadow colors pop. And the Urban Decay Naked Basics Palette, oh wow! I've been wanting this for so long and now that I have it I'm sure I'll be using it every single day! So those are my giveaway wins, to be honest I really just wanted to give a shoutout to the ladies who had the giveaways. Hope you enjoyed this different kind of haul, it's got me thinking of my own next giveaway! Wow those are some great goodies you lucky duck :)!! Lucky girl! 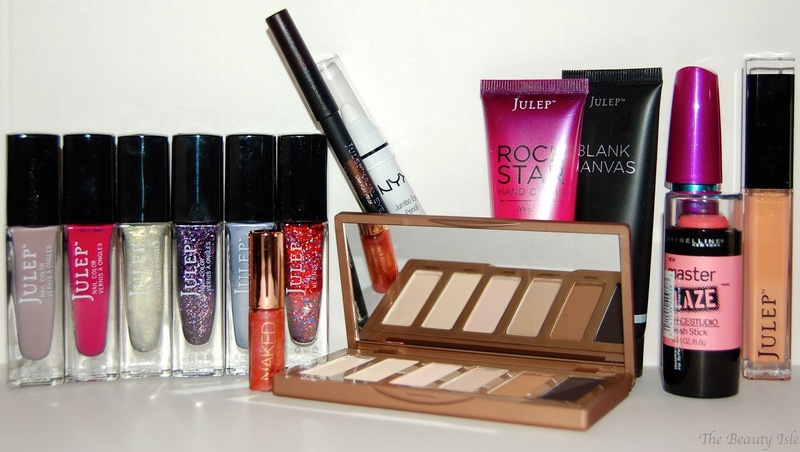 I would LOVE to win that Julep box lol - I am so nail polish obsessed right now! I know, they are really gorgeous colors! I really got lucky! Great goodies El!! I love my Basics and use it often, I'm sure you will too! Enjoy! I'm loving it so far too! Wow! Lucky gal! Pleaseee do reviews on the Naked Basics palette and the Maybelline cream blush! I would love to hear your thoughts on the mascara too! I really want that Nyx pencil too! Thanks for sharing love! Oh I already did a Frugal Friday review of the Falsies mascara and it's def. a good one! I know, I feel like somehow I got lucky and maybe I should try to play the lottery haha!